ScreenFlow is a video editing software product made by Telestream. ScreenFlow provides specialized features for screen-recording or producing ‘screencasts’. GeniusDV provides everything you will need to create the perfect screencast. 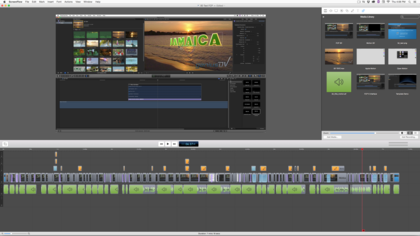 ScreenFlow has also evolved into a full featured video editing suite. In addition to video editing capabilities, ScreenFlow provides a variety of unique features that are specific to producing high quality screen recordings. There is no other product on the market that provides the necessary tools for creating an entire training video all within one software package. To give you an idea of what’s possible, GeniusDV has produced almost 300 video’s that have been completely edited in Screenflow. *This course is also availble for on-site training. One Price for unlimited individuals. You can record your computer’s desktop, a video camera, microphone and computer’s audio all at the same time. Full screen capture ‘even retina displays’ which is optimized for the most efficient screen capture quality. It has an intuitive professional non-linear editing interface. Publish directly to QT Movie, YouTube, Vimeo, etc. Optimized to take advantage of latest Mac OS X productivity enhancements. This class primarily focuses on using ScreenFlow for producing software training videos. However, many of the topics covered are related to using ScreenFlow as a full featured video editor. Day 1: Focuses on the critical fundamentals of the ScreenFlow Interface. 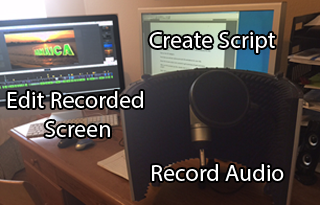 You will write a script, record voice-over audio, record video content, and ingest additional video content. You will also learn how to record content from an iOS device. You will master all the aspects of video and audio editing all within the Screenflow interface. Day 2: Master working with video properties and specialized actions. Add special effects, and learn how to use green screen. Learn to manage your unused media. You will prepare and export your final product to YouTube, and/or your favorite platform of choice. Classroom Training in Orlando, FL. Our organized ScreenFlow class is a great choice for individuals. Whether you’re a seasoned editor or just starting out, our classes average only 4 students, so your instructor will be able to keep you challenged with highly personalized attention. OnSite Nationwide Training at your studio. If you have 3 or more people needing training, it may be cost-effective to bring our consultants to you. We can customize the training to your needs, which means we can move faster and go deeper into the topics and techniques that are relevant to your workflow. Plus, we can consult you on how to structure your specific workflow to make the fullest use of the Creative Cloud tools. We can train at your location or we can host your custom class at our Orlando training facility.